I want to talk about Women wearing Ties. As most of you are probably aware, I have a Silk Tie Collection as part of my product range, and I also offer a bespoke design service for ties, which is popular for people attending special occasions such as weddings. My ties are popular with men of all ages, and that is great because guys, you look fantastic in ties. However, I am on a mission to get women wearing ties too. Why? Firstly because all of my pieces (at present) are designed to be unisex, and secondly, because ladies look utterly fabulous in ties! (See picture of my Grandma, Mum & Dad below, Mum absolutely rocking a bright red tie). 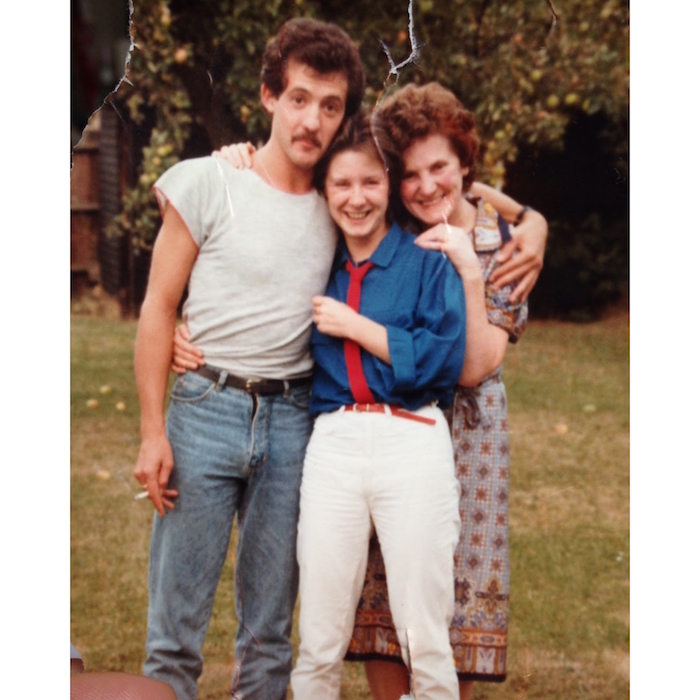 1984: My mum wearing a red tie styled with a blue shirt & white jeans. Whilst I don’t really buy into seasonal fashion, preferring to stick to my own style and just purchasing key pieces when I see them, I still totally love fashion. I therefore read a lot of fashion magazines and constantly immerse in what is going on in the industry, so was very excited to see during Fashion month in February, that ties are back, for men AND women. The entire Gucci look might be a bit out there for day to day wear, however I think these women look incredible and demonstrate how cool ties can look and how they can enhance the individuality of your outfit. So, how can you wear your tie? The fail safe option and my favourite way to wear a tie in an elegant way, is with a crisp, white and slightly oversized shirt. 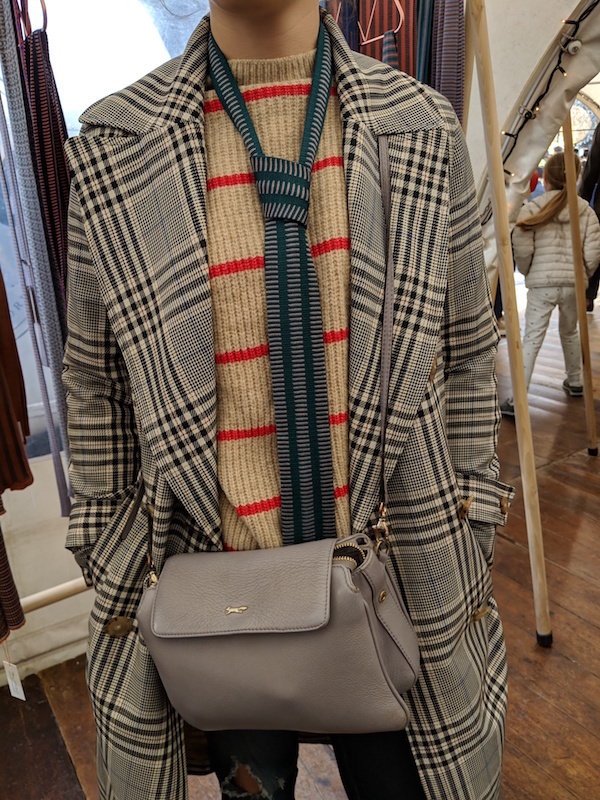 This can be dressed down by pairing with jeans and boots for a cool casual look, or smartened up by tucking the shirt into an elegant pencil skirt or bold flared trousers. I also love a colourful tie with a black silk shirt. This is fabulous if you are one of those people who likes to wear a lot of black, as it is a smart and unique way to add colour to a monochrome outfit. Bo wears the Drips Silk Knitted Tie in silver & purple, part of The Glacial Collection. Ties absolutely do not have to be worn with shirts. As you can see in the images below, they can look really great with a simple knit or plain white t-shirt and a statement jacket, layered over jewellery or simply on their own. Beth wears the Broken Dash Silk Knitted Tie in teal & purple. Lucy wears a purple & rust Silk Tie in a one off unique swirled design. I hope that this post perhaps inspires you ladies to mix up your accessories and try wearing a tie. Perhaps test out a few from your husband’s/son’s/father’s/friend’s collection, and of course, shop mine here.